Why choose STP Commercial Window Cleaning Services? With more than 20 years experience, a team of expert operators and an enviable track record in health and safety - we can take on any size commercial window cleaning project. From the tallest of buildings, to the largest and most challenging of projects, we have both the expertise and the experience to get the job done safely, efficiently and to the highest standard. We provide a top quality service and deliver excellent value to our many long-standing clients. Rigorous internal policies and procedures help to ensure that we maintain our high standards. 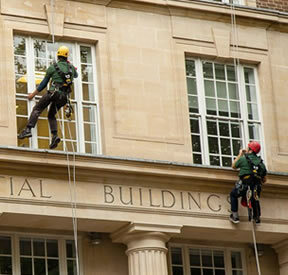 From telescopic ladders to abseiling down the side of a building - we do it all! 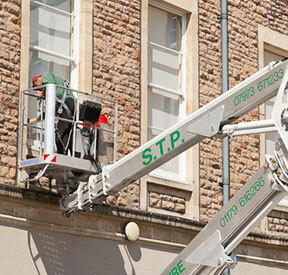 STP cleans the windows of more high rise buildings in and around Bristol than any other company. We also work with businesses throughout the South West and Greater London. Our experienced operators are fully IRATA and IPAF trained and fully insured. We are extremely proud of our 100% track record of no accidents or incidents throughout our company's history, which has won us the prestigious Safe Contractor Accreditation award. We own our own cherry pickers and the saving we make by not having to hire equipment is passed directly on to our customers. We also hire out the machines with a fully qualified operator so that businesses can carry out maintenance. 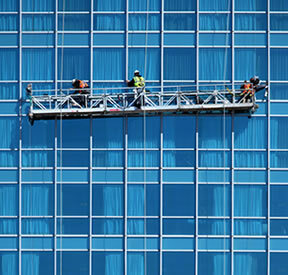 Our operators are fully trained in the use of platforms (or cradles) for accessing and cleaning windows at high level. They have each received site-specific training for individual buildings by qualified instructors. Our abseiling heroes carry out more high level rope access cleaning work in the Bristol area than any other company. Our staff are fully IRATA trained and qualified and all work is carried out in accordance with the strict IRATA guidelines. Our success is down to a combination of our experience, our high quality service and our excellent Health and Safety record. We work hard to maintain these high standards by following a strict code of conduct. All HSSE policies and procedures are regularly audited and our staff regularly attend safety workshops and seminars. In addition, our management team oversees all cleaning contracts and carries out quality control checks, both on staff conduct and their work, to help ensure that every job is completed to the highest standard.